While as a purist the design has no appeal to me at all the base plate should alleviate some of the battering to the recoil shield. 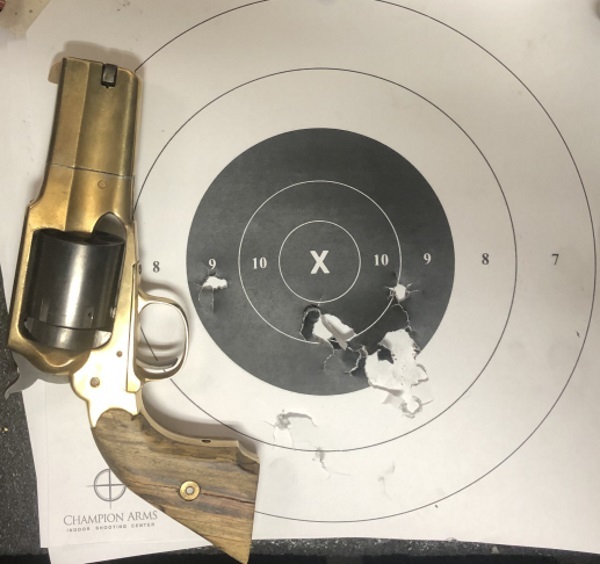 I've heard of people installing a steel washer to guns that have the cylinder ratchet imprinted on the recoil shield and the guns have been good to go afterwards. Thank you- that's an excellent tip (about the washers.) I will keep that in mind against need! 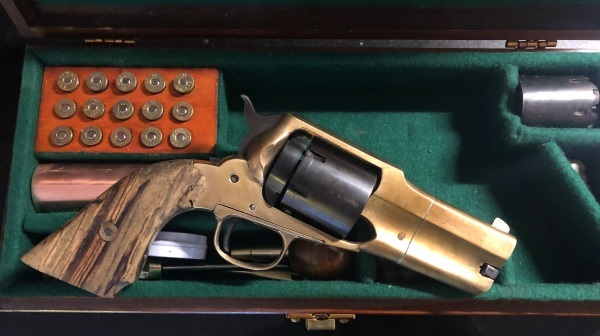 I don't see a problem with a conversion with a brass frame even with smokeless powder if you keep your loads on the low end. Its your gun you are the one shooting it, probably most of the time. If something starts to go wrong frame stretching timing is off or what ever you will notice it and do something about it, stop shooting it or whatever. None of my guns are ever shot without me being there I don't loan them out or shoot any reloads but my own. Not to say I wont some day make a reloading mistake but if I do it is entirely on me. I have been reloading for thirty five years or so and never have had a problem. Yep- and this gun will never be fired by anyone but me without my direct supervision (until after I am dead, after which they will be left to a knowledgeable person with complete instructions!) I've only been reloading for a few years, but in that time I've reloaded thousands of smokeless rounds for BP cartridges and guns, and it's never been an issue because I am careful, do my research and err on the side of caution. One of the great joys of my life is shooting my antique firearms; I have no interest in damaging them! That sure is a nice looking kit that you have put together!! Really appreciate you bringing us along. I'm a traditionalist too but can recognize thoughtful and skillful work when I see it. Great job of work there, Tinker. Beautifully done! The work of a real craftsman! Having a "steampunk" impression, to my eyes, it reminds me of something that Emmet (Doc) Brown, from the Back to the Future series, would carry while stranded in the 19th Century. It would have made a nice paring to his scoped lever rifle! I was just thinking that would make a nice movie prop. Yep. Looks to be an ideal pack to town on Saturday night lil numbuh. 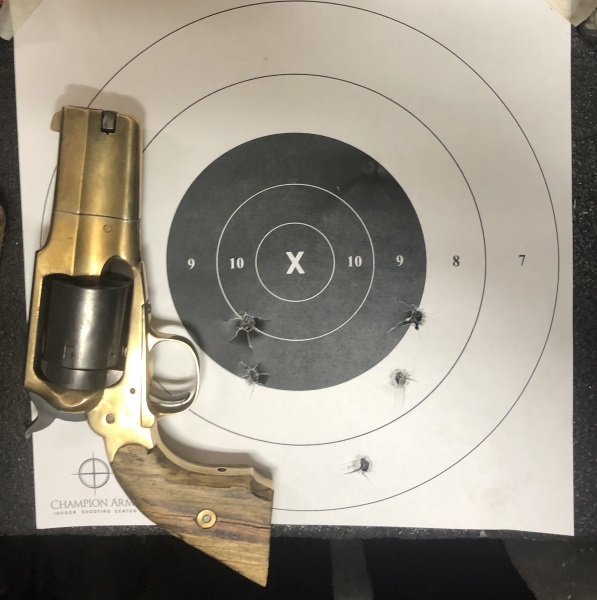 OK, somerthing went wrong with my .44 Colt loads and they were seriously underpowered- but not completely inaccurate as this 7-yard target shows. The gun shot a bit low in both cases, so I'll be reducing the height of the front sight. Have to say, I'm quite happy with the gun's performance and function!